If the Shoe Fits… Wear it! Your feet work hard every day, carrying you through your daily tasks while you walk, stand, carry, lift, climb, clean, work, and exercise. When shopping for shoes, you should think about protection from injuries. If you have foot, ankle, or leg pain, a foot imbalance may be at fault. You may need to see a Podiatrist. Your feet absorb the impact of at least three times your body weight with every running stride. This impact may be even greater in activities like basketball, netball and aerobics. Inappropriate, ill-fitting or worn-out shoes can cause blisters, corns and calluses, lower limb and foot injuries such as heel and arch pain, Achilles tendonitis and stress fractures. Although the right pair of athletic shoes may not enhance sports performance, it might help you avoid discomfort or even injury. If you participate in a sport more than three times a week, you should consider a sport-specific shoe. Forces and motions that occur in different sports vary greatly. Because of these differences it is important that active participation in varied sports require varied shoes. Running shoes are primarily made to absorb shock as the heel strikes the ground. Tennis shoes, in contrast, provide more side-to side stability. 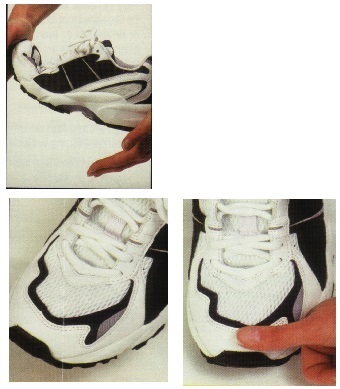 Walking shoes allow the foot to roll and push off naturally during walking. They usually have a fairly rigid arch, a well-cushioned sole, and a stiff heel support for stability. Although the right pair of athletic shoes may not enhance sports performance, it might help you avoid discomfort or even injury. If you participate in a sport more than three times a week, you should consider a sport-specific shoe. LENGTH: The shoe should allow for the elongation and spreading of the foot during activity. WIDTH: The shoe should not place pressure on the toes or allow excessive movement of the foot within the front of the shoe. DEPTH: This is particularly important for those needing to accommodate an orthotic insert. HEEL WIDTH: The shoe’s heel width should suit your heel width. Again, if you wear orthoses, extra width may be needed. GRIP: When walking, there should be no heel slippage. It is recommended that you have your feet measured every time shoes are purchased as ageing, injuries and pregnancy may change foot size and shape. Try to shop for shoes at the end of the day when your feet are generally at their largest (most swollen). Wear the type of socks you usually wear during exercise, and if you use orthotic devices (orthoses) for your feet, make sure you wear them when you’re trying on the shoes. Straight or semi-curved lasts offer support. Curved lasts are best for supinators (feet roll outwards). Minimal torsion or twist is required, but not so you can ‘wring out’ the shoe. Midsole density varies and needs to be spe-cifically suited to the individual foot type and activity. Shoes should be firmly fastened to prevent foot fatigue. Specific lacing techniques may improve comfort and support. 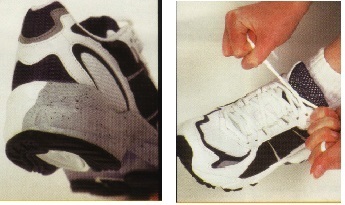 The shoe should flex at the ball of the foot to avoid problems with the big toe joint. Uppers should be suited to the requirements of the sport. 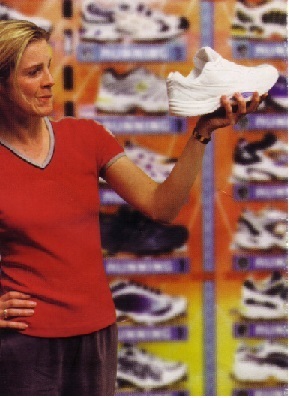 When standing, there should be a thumb’s width (about 15 mm) from the longest toe to the end of the shoe. Pronation is the inward rolling or flattening out of the foot. Supination is the outward rolling or arching of the foot. Both movements are normal and occur during walking and running. Pronation helps to absorb shock as the foot hits the ground while supination helps to push or propel a person forward as the foot leaves the ground. When pronation or supination occurs excessively, foot problems may develop. Causes of this may be weakness of muscles, tendons or ligaments or poor lower limb alignment such as internally rotated hips, knock knees and poor foot structure.